For years and years, I have taught a variety of hands-on workshops at a wide range of venues, and during that time, I’ve heard iterations of the same type of comment over and over. Now I belong to a few mixed media and journal groups on social media, and I’m consistently seeing variations of this same kind of comment. I feel like I want to take a little bit of time to ponder it and address it. Over and over again, I’ve heard one person or another or I’ve read one comment or another that all start out in a similar vein. “Well, I’m not really in artist.” “I’m just a beginner.” “I don’t really know what I’m doing.” “I’m not talented like others.” These statements and others are usually said right before sharing their work or introducing themselves or offering a comment, and I just can’t help wondering why we feel the need to qualify our art, our words, and ourselves with these statements. What has made us so ready to diminish ourselves and the things that we do? We seem so willing to disqualify ourselves as if we don’t really belong in the conversation. Is it simply fear and doubt? Are we just conditioned to dim our own light? Why are we afraid to shine? This isn’t something new, and I’ve pondered these ideas in the past in my journal and on the blog, but it’s something that is consistent — something that so many people struggle with and seem to utter at one point or another. Even folks that you think really wouldn’t feel that way, can feel exactly that way, and I just can’t help wondering why we make ourselves small — why we dim our own light. And I wonder what if we turned the narrative around, and spoke our truth with light and confidence. What if we stood tall, and allowed our personal truth to shine out of every inch of our bodies? Life isn’t a competition, and art isn’t a race. It isn’t about who has more or who is better or worse, but we make it that way. We want to compare ourselves with others, and we seem to want to bury our faces and hide. What if we simply shared ourselves openly without qualifiers — without tearing ourselves down — without dimming our truth? In a way we set ourselves up for failure from the start. By qualifying the work that we do or the comments that we make with these statements, we set the bar low and brace ourselves against what is to come. Are we afraid that people will confront us? Are we afraid to be called out and ridiculed? Or is it just a matter of the Imposter Syndrome where we simply feel that we’re playing at making art and not really creating? I know a lot of it has to do with confidence and self perception, and it might be boiled down to how we were raised and how we were praised. But why do we beat ourselves up over our creative endeavors? Why do we not claim this part of ourselves wholeheartedly and stand proud? Why does it seem shameful to share such an important part of ourselves? It’s a lot of questions, because I don’t have an answer, I’m just asking folks to stop diminishing themselves and making themselves small. Stand tall, and let your personal truth shine! Although I have several major projects going on, the New Year has started out with a major disappointment — one that hit me pretty hard. I haven’t said anything until now, but a class that I was scheduled to teach at the renown John C. Campbell Folk School next week has been cancelled due to low registration. The class just didn’t get enough sign ups to run. I was super excited a year ago when I got the class accepted, and has been a dream of mine to teach there. Over the past few months, I started to really look forward to the trek down to western North Carolina and spending five days diving deep into some sacred work. It was a bit of a let down to receive the news, especially since I had two other workshops cancelled last spring for the same reason at other venues. It was definitely a bit of a blow, and it left me kind of questioning and second guessing myself as I wondered if I was on the right path. But I’m trying to see the silver lining — trying to turn the negative into a positive. When the classes were cancelled back in the spring, it allowed me to focus more on getting my studio and artwork ready for a big studio tour that I was a part of. It gave me added time to make the stour tour a big success, and I’m trying to see this latest disappointment in a similar light — as an opportunity to focus my energy elsewhere. I think the universe is trying to tell me that it’s not the right time, and that there’s something else, perhaps something bigger, that I need to do right now. In many ways, I think that I just haven’t connected with people. I’ve always been a very socially awkward in person, and I think I’m doubly so online. But for the past month or so, I’ve been making a concerted effort to reach out and to connect in a variety of ways, and I think that’s where my energies need to go. I’m looking at this disappointment as an opportunity to reassess what I want and what I need, and to offer up more of myself and to connect in much deeper ways. So, a big thank you to anyone who has been a longtime supporter — who has been around since the beginning of this journey, and a big thank you to anyone who I have connected with recently. I feel a sense of growing support — of a growing community. I feel the tide shifting. To use a term from my dear friend Erin Keane, I see a sea change coming! Here’s to finding the positive, shifting energies, listening to the universe, and creating a sea change! Thinking Thursday: We are Creative! As we move further into the New Year, I wanted to share something that I shared a long time ago, but it’s something that bears sharing again as it’s a deeper dive into my thoughts about creativity. We are all born with an endless capacity for creativity. So why then do so many people believe that they're not creative? People hold several myths and misconceptions about creativity that keep them from seeing the truth. First they may believe that creativity is linked directly to intelligence, and many people don't feel that they are particularly intelligent. Hence, they believe they are not particularly creative as well. Second they may believe that creativity is confined to certain fields of work such as design, writing, visual and performing art, and they simply are not the “creative” type. Third they may believe that creativity is only for special types of people — geniuses, like Einstein and da Vinci, and who can be an Einstein or a da Vinci? Finally, they may believe that creativity is something that either you have or you don’t, and as such, it is a “god-given” talent and there’s no point in trying if you’re not one of the ones endowed with creativity. So, many people go about their daily lives believing that they are not and never will be creative. They are completely and utterly wrong. Creativity is part of our original programming, and since we were lucky enough to be born into the human race, we are creative. Look at any child for proof. We see the curiosity, the imagination, the sense of wonder, and the freedom from doubt little kids have, and at one time we were all little kids. We all had that innate creativity. So what happened? In many ways we grow out of our creativity, and as we grow older, we close ourselves off from it through the choices we make. Much of life seems to be about closing ourselves off and closing ourselves up. It’s sad and unfortunate, but it happens so easily. As infants and toddlers, we see the world as an immensely large place with endless possibilities and so much for us to take in and experience. At such a young age, we soak up these experiences getting our hands into everything as a way to explore and learn about the world. We are open to life and living, and we trust and love without fear. But we quickly begin closing off parts of the world as we grow and learn. We close up and shut down many of the possibilities available to us in our lives mostly because of fear and conformitu, and we lose our creative confidence. We learn right from wrong, good from bad, appropriate from inappropriate, acceptable from unacceptable. We get caught up with doing things the “right way” and with not being wrong, and we shut the door on things that don't fit with what we're learning. We get set in our ways, and we close off and fit ourselves into boxes that, many times, are defined by the expectations of others. We have to act a certain way, be a certain person, or do a particular thing. Our lives get narrower and more rigid as we learn to conform. We lose the flexibility of youth, and we suppress our curiosity, our imagination, our sense of wonder, and that freedom from doubt. Our worlds get smaller and smaller as we try to fit in, play the part, and strive for acceptance, and we don't live up to our potential. We are closed in, and often, we feel that we are locked away from our creative impulses. But every once in a while, we have a fleeting feeling that we are suppose to be something more — something greater. In those instances, we long to break the confines and be different, but we feel the constraints from all those years of conditioning. We bury that creative or expressive urge with excuses, fear, and doubt, but it keeps coming back. Sometimes it becomes a nagging sense that we want to change — that we want to be free from that little box we’re confined to, but how can we break free? We are shut in, and we mistakenly think that we are locked in. But in fact, we are not. All we need to do is to start opening ourselves to the creative impulses. We need to nudge open the doors we have closed, and we need to peer behind our beliefs and our doubts. We need to open our minds and our hearts and lean into the fear and the pain. We may just discover our true selves. Once we begin the opening process, we can push ourselves to break out of our normal thought patterns. We can stretch ourselves and begin to break from that narrowly defined space. All we have to do is just be open to the uncertainty, to the uneasiness, to the ambiguity, and to the fear. We have to suspend judgement and go back to that time when play, wonder, and surprise were such a part of our worlds. We may find that we begin to redefine who we are and how we are in the world. We may discover that we're more intelligent and creative than we originally thought. We just need to be open in order to gain back our creative confidence. We can begin to see the expanding possibilities and potential of our everyday lives. We have to redefine what it means to fail, and we must learn to see that the only way to truly fail is to never try at all. It is fear and doubt that stops us and keeps us from ever trying. We fear judgement, failure, and insignificance. We fear rejection, discouragement, and loss. We doubt our ideas, our abilities, and our resolve. We doubt our inventiveness, our resourcefulness, and our courage. But we have so much to gain. We can grow, shine, inspire, express, open, and live, if we only have the courage to open ourselves a little bit. Slowly, we can open ourselves more and more allowing the creativity to flow stronger and stronger. Even the mightiest river begins as a trickle. We are only limited by our reactions. We can react with tightness, control, and doubt, and allow our world to close down again restricting the flow and bottling up the creative energy. Or we can react with openness and acceptance, and become limitless and free. When we are open, we let go of ego, perfection, end results, and the final product. 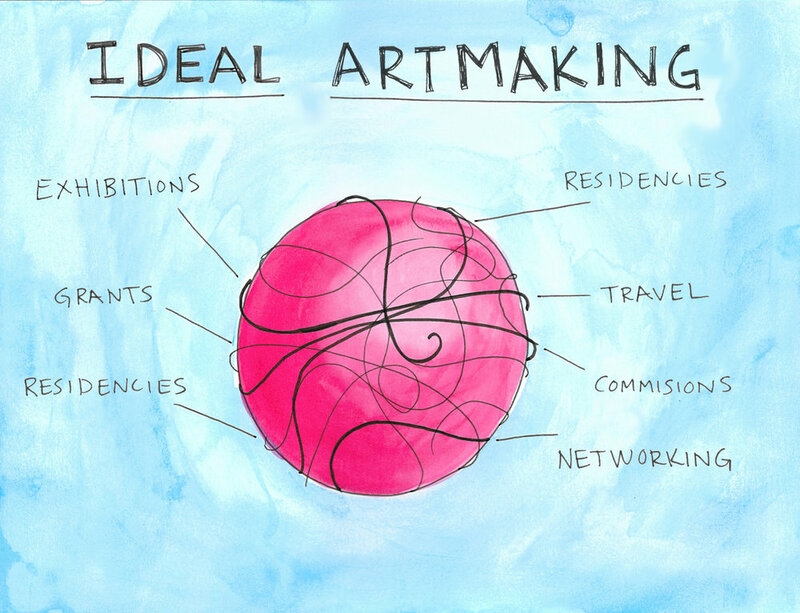 We embrace the creative process as a messy, but fulfilling, part of life. But how do we go about opening ourselves to this creative potential? I think that I take it for granted that people just know my story. I’ve been blogging since 2007, and I’ve been on Facebook since 2008, so it’s easy to forget that there are people that are just now discovering what I do, and they may not know who I am or where I come from. So I wanted to take sometime as this New Year begins to reintroduce myself and share my story. In the most concise way, my story is that I am an artist, writer, and educator that believes that everyone is creative, and I am on a mission to help people reconnect with their creativity. Now a lot of people will argue that they don’t have an ounce of creativity, but that’s just not true. It might be buried. It might be closed off. It might be locked away, but like writer Patti Digh would say, if you are human, you are creative. Why do I believe that? I don’t believe it, I know it. I have been making art for more than 40 years, and I’ve been teaching for more than 20. I feel that I’ve learned a thing or two about creativity in all of that time. I have always loved art. I drew and colored continually as a child, and I pursued it and went to school for it. I taught art for 20 years in the public schools of Maryland and Virginia. In 2016 I stepped away from public school teaching, but I continue to teach at retreats and workshops across the US. I also manage and teach at a local art center in Round Hill, Virginia. 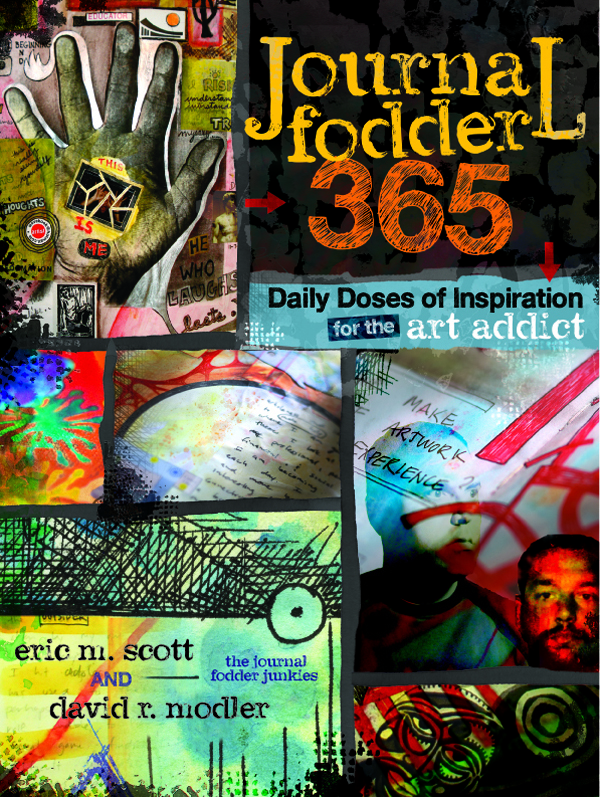 I continue to make my own art, and I draw, paint, sculpt, and work in a visual journal. I have spent my life exploring my own creativity, and figuring how to help others be more creative. Now creativity isn’t just an art thing, it’s a human thing, and you don’t have to want to make art to be creative. As Sir Ken Robinson says, creativity is about coming up with something new that has value. Creativity stretches across all human endeavors. Without creativity, we wouldn’t have landed on the moon, and we wouldn’t have the internet, and we wouldn’t have the music, the movies, the clothes that we love. We always have problems to solve, things to figure out, and lives to make the best of. This all takes creativity. As a visual artist, I approach creativity from that direction, but we are all creative. 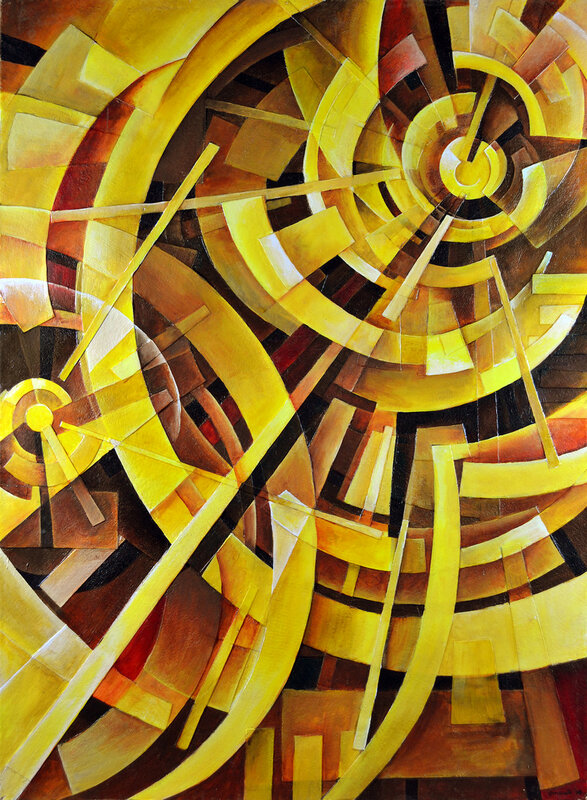 When I first got into teaching, I thought that I wanted to teach my students about art, but as the years went on, I found out that, yes I was teaching them about artists, materials, and techniques, but more importantly, I was teaching them how to connect with their creativity. I’ve worked with thousands and thousands of children and adults, and I am always blown away by the things they can come up with when they can let down their defenses and create from an authentic place. This notion is why I don’t teach projects — why I don’t craft recipes for people to follow to make the things that I make. I’d much rather share ideas and techniques, and help students find their own voice and create the work that is meaningful to them. This philosophy led to the two books that I coauthored with David Modler, The Journal Junkies Workshop and Journal Fodder 365. In these books, we share ideas, concepts, materials, and concepts, but never tell people to make and create certain things. In everything that I do, I want to help people realize that they are truly creative individuals capable of creating meaningful lives. Of course, I’ve left out a whole lot of details, but I’m not setting out to write a memoir, just to set the stage for my story. And I hope that I can help you to reconnect with your creativity and inspire you to create the meaning that you seek! Today is the first day of school for area kids. This will be the third first day of school since I stepped away from teaching a little more than two years ago, and as many of my teacher friends have already been back at school for a while getting their rooms ready, planning for a new year, attending professional development, and sitting through meetings, today will be the first day with students. I don't miss it! I miss working with students. I miss the friendships with colleagues, but I don't miss the hassle and the hustle of being a public school art teacher. Two years ago I stepped away, and I don't regret a minute of it. Although it hasn't always been easy, things have been working out. Bills have been getting paid, and I am surviving. It's still a hustle to schedule and promote classes. It's still a lot of work to make art and to sell it, but month after month things fall into place. I am grateful for that. I am grateful for everyone who comes out for a class, for everyone who has purchased art, and for everyone who has supported me in any way - small or big. So, while I wish all of my teacher friends a good first day of school and an awesome new school year, I am glad that it's no longer me in the classroom. I'll be in the studio, plotting my course and planning what's next! Today is the first day of school for local kids, and it has been more than a year since I stepped away from teaching. To mark the first day of school, I thought that I'd re-post a piece that I wrote explaining why I resigned from teaching to pursue my own path. I could rant and rave about all the reasons that I stepped away from a twenty-year career as an art teacher in the public schools, but that would be just self-satisfying whining and complaining. I could simply say that it was to follow my dream of being an artist, but that’s just part of the reason. Instead of ranting and raving or giving a simple answer about following a dream, I want to show how teaching had changed during those twenty years in order to give people a little perspective into what teachers face. Why I left a salaried position with good benefits to be a self employed artist boils down to one thing. 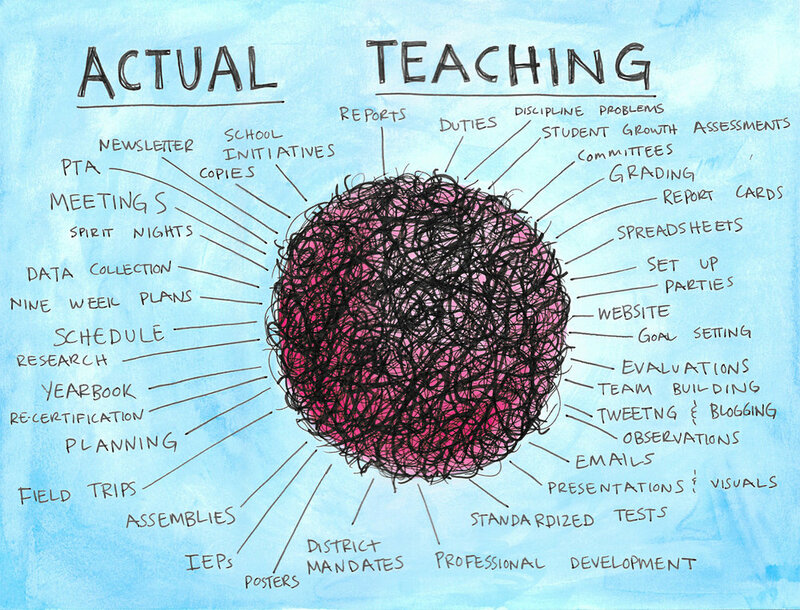 Teaching is a giant hairball. If you're not a teacher, you might be scratching your head right now, thinking, “Huh?” My teacher friends probably already understand. Let me first say, that this is not my own idea. I am blatantly stealing the analogy from Gordon MacKenzie who worked for Hallmark Cards for thirty years. In his book, Orbiting the Giant Hairball: A Corporate Fool’s Guide to Surviving with Grace, MacKenzie describes how he survived working for Hallmark as an artist by orbiting the giant hairball that was Hallmark. By staying disentangled from the bureaucratic, corporate mess he was able to survive. He describes Hallmark as a giant hairball, and how every new decision, policy, and procedure added another hair to the hairball, and over time, Hallmark grew into a massive tangle of hair because hairs were never taken away, only added. I read that, and I thought, “Teaching is a giant hairball!” But there’s no way to orbit around it like Gordon MacKenzie did. As a teacher, you can’t stay on the fringe and not be pulled into the mess. You have to dive into that mass of tangled hairs and fight your way to clear a path to teaching. Simply put, teaching is full of rules, procedures, protocols, policies, regulations, and expectations that get in the way of teaching, and it has always been that way. But it has grown worse steadily with each passing year. It has become a bigger hairball, and that is why I left. I grew tired of fighting the massive tangle of hairs that obscured why I was there — the teaching. Let me extend MacKenzie’s analogy a bit to illustrate this to the fullest extent that I can. Let’s imagine that teaching is a red rubber ball. Visualize that bright, bouncy ball. In it’s purest and simplest form teaching is about the connection between the teacher and the student, and there isn’t anything that gets in the way. You see the red rubber ball clearly and there are no tangles, no hairs, no impediments. The teacher has ready access to the red rubber ball of teaching. This pure teaching is rarely the case in public school, but there are instances that come close. Tutoring an individual one-on-one or teaching a class to the general public at an art center or community center might be the closest, but it’s not the usual case in public school. In reality there have always been rules and regulations in public schools, so that bright red ball of teaching has always had a few hairs wrapped around it. There is no way around it. There have to be policies, procedures, and expectations in a school, or there might be anarchy. There has to be some kind of bureaucracy, but ideally, it shouldn’t hinder the teaching. These hairs shouldn't take much time to deal with allowing the teacher to quickly uncover the rubber ball and dive into teaching. That would be an ideal situation in today’s world of teaching. And that’s kind of how it was when I started teaching twenty years ago. There wasn’t much that got in the way. I had a schedule to contend with, meetings every now and then, planning to complete, grading to do, and a few phone calls to make. But those things were pretty easy to deal with, and I felt like much of my time was really dedicated to that connection between the students and myself. I was pretty much left alone, and the administration checked in occasionally to see how things were going. So, yes, teaching was a hairball, but it wasn’t daunting and overwhelming. It wasn’t a giant tangled mess yet. But let me try to show the scope of things that were required, but are not necessary or even productive to teaching. During my last few years of teaching, I had to deal with an increasing number of things that were handed down by administrators, and I had to do them. I had to untangle this mass of hairs that left little room to focus on the actual teaching, and administrators were constantly hovering and micro-managing to make certain that they were done so the appropriate boxes could be checked off on my end of the year evaluation. Let me share a few specifics. Each year new district-wide mandates and requirements and new school-based initiatives and expectations were announced, and each required hours and hours of professional development to learn about these new ideas and how to implement them, and planning to figure out the best way to implement them. The ideas had to be implemented, and of course, data had to be collected to support these multiple initiatives. To show that we had implemented them, we had to fill out and file reports that documented the progress and completion of the new initiatives. Each of these things added many more hairs to the massive hairball. When I wasn’t dealing with these district-wide and school-based mandates, I had other issues to deal with, like the hundred emails that came daily. Most of them could be ignored, but a handful of the emails needed to be answered thoughtfully and diligently. Simple, quick replies wouldn’t suffice, and there was the expectation that a reply would be sent within 24 hours. I had to deal with rising discipline problems because students were stressed out from the regime of standardized tests and assessments they had to endure. Many students just couldn’t hold it together all the time, so there were referrals and reports and conversations with parents, teachers, counselors, and the principal about it all. Each of these added more and more layers to the hairball. There were the constant disruptions in the schedule with assemblies, field trips, testing, parties, and special events. It was impossible to keep all the classes working at the same pace because of all the things that interrupted the flow of instruction and the sequences of learning. Of course, there were meetings. They might be a necessity of schools, but there were faculty meetings, and team meetings, and committee meetings that never really seemed to accomplish anything. I guess they did satisfy part of the School Improvement Plan. I can’t forget about duties, where teachers were taken out of their classrooms to cover the hallway, or to stand in a noisy cafeteria, or to stand outside in rain, sleet, snow, and heat for bus or car duty. All of these things just added more hairs to the giant hairball. Grading was a whole other situation. It was never a simply task, but when grade books moved to the Internet so that parents and students could have access to their grades 24/7, a whole new layer of hairs were added to the red rubber ball of teaching. A simple task like entering an assignment to be graded (not the actual grading, mind you) could take an hour. That’s just for a single assignment. So, more hairs. I list these things not to complain, but to illustrate some of the things that teachers have to deal with that have little to do with actual teaching. I know that I haven’t included everything, and there are many other things that I could add. I’m quite certain that other teachers could add things that I can’t even think of right now. I just want to make it clear that teachers have to untangled a whole lot just to get to the teaching, and it’s not like once all of this tangled mass of bureaucratic stuff is cleared, you're done with it for the year. No, a teacher has to deal with this on a daily basis. You have to go in and untangle the giant hairball each and everyday so that you can get to what’s underneath — that red rubber ball. After all, that’s why there’s school in the first place — to connect with students and teach them. The most important part of teaching is buried, and a teacher has to work hard to clear away the extraneous stuff. It’s exhausting to struggle with that tangled mess everyday, and the only way to deal with it — to get it all untangled is to stay late, come in early, or take work home with you. There’s just not enough time in the school day to get it all done because school districts add more and more for teachers to do but never add more time, and there becomes an expectation that you will dedicate your own time to get it all done because, after all, it’s for the kids! Though the teacher’s contract gives specific times that the teacher is suppose to be at work, all the teachers I know, work well beyond the contract. The great teachers do that and more. They sacrifice time with family and friends in order to get it all done. They work hard going in on weekends and taking work home, but at the same time, there is a devaluing of the profession. Administrators and principals see that teachers will continually give of their own time, and so it becomes another expectation. But all of those extra hours of staying late and going in early and on weekends deflate the profession and the salaries of the teachers. And that’s what I couldn’t take anymore — the devaluing of my profession by the school board and the administrators by heaping on more and more every year, with the expectation that it will all just get done and, oh, there will still be outstanding teaching and learning going on in the classroom. In the end I didn’t have the energy or the stamina to go in day after day and deal with so many things that had nothing to do with the core of teaching. I have always loved sharing my art and my passion for art. Teaching always gave me a way to do just that, but after fighting to untangle the mass of hairs day in and day out for years and years, I had no energy left for my students, for my art, for my wife, for my friends, or for myself. I was burned out, and I couldn’t take it anymore. I’d come home exhausted and worn out, and all I wanted to do was to sleep or veg out in front of the tv. I used to love teaching, and there was nothing like seeing the look on a student’s face when they struggled and struggled with an idea or concept and then finally got it. But teaching had changed so much in the twenty years that I taught. It seems like teaching now isn’t about the connection between student and teacher, though administrators try to tell you that it is. Teaching seems to be about dealing with a tangled mess and checking off boxes to say that you’ve done it, and that’s why I don’t love teaching anymore. Teaching changed, and I just don’t love it. I’m afraid that it’s just going to get worse, and that’s very unfortunate and very disheartening. Teaching is a giant hairball that keeps growing and growing, and I just couldn’t take untangling that mess anymore. That is why I left. Creativity like any act in life is a spiritual act. We seek meaning in our lives in many different ways, and the act of creating — the act of making something ourselves — helps us to not just find meaning, but to create it. All humans have an innate need to create, to build, to paint, to cook, to sew, or to make something where there was nothing but a lump separate parts. Through the act of creating we get in touch with ourselves and begin to create the meaning that we seek. But many people believe that they are not creative. They believe that the creativity fairy has passed them by or that they just don’t have the natural talent or that only certain people are gifted with creativity. But the truth is we are all creative — every single one of us. But then why do so many believe that they are not? We might just have too narrow of a definition for creativity. We are all unique and different, so we are creative in very different and unique ways. We are not all the same, but we all have the innate ability to make something new that has value. For one person it might be through music and song, and they have a gift for putting together melodies or lyrics. For another it might be using paint to create colorful and moving images. Yet for another it might be mathematics, and they see the path for solving complex problems. For another it might be a way for an offense to stymy the opposition in football. All of these rely on creativity. Creativity is not a single thing. It’s not a one size fits all thing. It’s not just a thing for the geniuses. It’s not just a thing for those artsy-fartsy folks. It’s a human thing. But we have been socialized to believe that creativity is for special people or it’s about special subjects or only certain people are creative. Many people have closed themselves off to the possibility that they are creative, and so they become unwilling to even try. But the urge to create — that innate need has persisted, so they rely on companies, corporations, and other individuals to show them what and how to create. With the proliferation of DIY shows, books, websites, and YouTube videos, it’s simple to let others figure these things out — to sit back and rely on someone else’s creativity. Though they may have taken the steps to sing, to build, to sew, to paint, and to make, they have left the creative decisions to others. This has led to companies, corporations, and individuals to can creativity — pre-package projects where outcomes are known. We get a taste for creating but without the problem solving, without the trial and error, and without the discovery. We get the sense that we are creating, and it quenches that innate desire, at least for a little bit. Many people seem to prefer this canned creativity because there is no risk. We know what the outcome will be, so we don’t have to risk absolute failure. We know it can be done because we can see the product, but we don’t come up with anything new. We simply follow someone else’s directions, and we don’t have to risk relying on our problem solving and critical thinking. It’s much more convenient to leave those decisions to someone else. However, we never discover anything about ourselves. We never create the meaning that we were looking for because we look for others to create it for us. How can we take something that someone else has created and connect it to our own personal meaning? Something might appeal to us. Something might speak to us, but it will never be authentic to us. In the end we become merely consumers consuming a product, but we can’t consume meaning. We must make it for ourselves. Over the past few months, I’ve been asked by friends, family, and acquaintances why I walked away from teaching. , MacKenzie describes how he survived working for Hallmark as an artist by orbiting the giant hairball that was Hallmark. By staying disentangled from the bureaucratic, corporate mess he was able to survive. He describes Hallmark as a giant hairball, and how every new decision, policy, and procedure added another hair to the hairball, and over time, Hallmark grew into a massive tangle of hair because hairs were never taken away, only added. Today was the first day of school for area students, and I must say that it felt a little odd looking at so many of my friends on Facebook posting those First Day of School snapshots of their kiddos heading off to school. It was strange when my teacher friends headed back for their first teacher workday a week and half ago. It's even stranger now, and there's no turning back. I decided to spend the morning out on the trail, so as students were waiting for the bus, I drove ten miles west to the Appalachian Trail and headed north for my first hike of the year. I haven't been hiking since last fall. It was a bit muggy, and I didn't go far. But it was nice to be out on the trail. I just love being out in the woods, but it was often difficult with teaching to find the time to go out and enjoy nature. I'm hoping to make hiking at least a weekly endeavor now that I have begun a new path in life. It hasn't been all fun and hiking. I have been busy in the studio and on the computer. I'm finding that being a full time artist is about half-time in the studio, and half-time trying to set up and coordinate things. So, I've been doing a lot of emailing, researching, and other general things on the computer, but I have some things in the works. I'll be sharing some of those things a little later. Today is a strange day for me. A day full of excitement and a little trepidation. You see, today would have been my first day back to school if I were still teaching. It’s the first time in twenty years that I am not reporting to my first teacher workday, and as all of my former colleagues are reporting for their first day of meetings, setting up classrooms, and catching up after the summer break, I’m sitting here drinking coffee thinking about what I need to do in the studio today. It’s oddly freeing, and little terrifying at the same time. I am on my own now. I am a full-time, self-employed artist. It’s official. I know it was official when I put in my resignation back in May. I know it was official when I got the letter from the school district confirming my “voluntary separation”. I know it was official when I cleaned out my classroom and packed up my boxes in June, but the last two months have felt like any other summer break that I have had over my 20 year career as an art educator. With all of my local teacher friends heading back to school today, it’s officially official. I am no longer a teacher. Back in June everyone kept asking if leaving the teaching profession had started to sink in, but even with the last day of school and bringing home boxes of stuff, walking away from a teaching career was somehow still a vagueness. I knew intellectually that I had resigned and that I would not be returning for a 21st year, but all of it still felt like it was somewhere off in the future. The summer was just the summer after another year of teaching, so my last day of school didn’t feel like it was my last day. Today, however, feels like the first day of a new life, a new journey. I now feel fully the freedom, the possibility, and the uncertainty of chasing my dream. I am looking forward to the adventure.